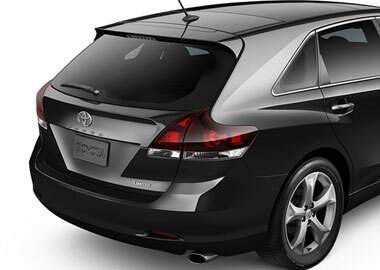 With a choice of two engines, a 4-cylinder and V6, Venza offers serious versatility. Venza’s V6 with Front-Wheel Drive accelerates from 0-60 in just 6.7 seconds—and can tow up to 3500 lb. thanks to its standard Tow Prep Package. Venza adds a low center of gravity, wide stance and available 20-in. wheels to make every arrival a powerful one. Whether the road is wet or dry, you can never have too much grip. The available All-Wheel Drive (AWD) with active torque control monitors each wheel, automatically distributing engine power to the wheels with the most traction. See and be seen. Venza Limited Daytime Running Lights (DRL) create an eye-catching profile in the dark, and during broad daylight. These stylish LED headlights ensure you'll be seen by everyone. 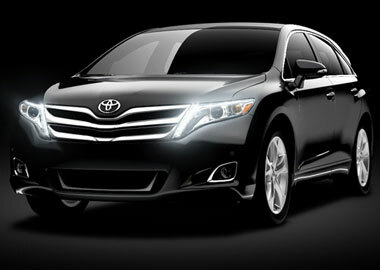 Venza V6 models come standard with handsome 20-in. 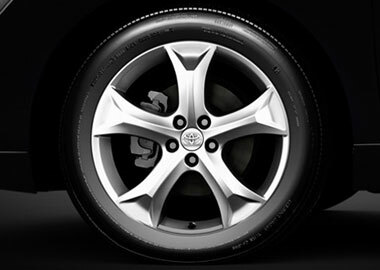 5-spoke alloy wheels fitted with P245/50R20 tires. A first impression is one thing, but Venza’s striking rear taillights with smoked lenses make sure the impression is just as strong on your departure. Some like it hot. Some don’t. Thankfully, Venza’s dual zone automatic climate control lets front-seat passengers select their own temperature settings. Once you experience it, you’ll wonder how you lived without it. As long as the Smart Key fob is in your pocket or purse, you can lock the front doors or liftgate on XLE or Limited models by simply touching the top of the door handle, and start the engine with the push of a button. And everything in its place, thanks to Venza’s many storage options. The center console features a storage tray, two large storage compartments and two cup holders. There’s also LED lighting in the large storage compartment, and a 12-volt accessory power outlet for additional convenience. Stay connected to all your entertainment and more. Available Entune™ Premium JBL® Audio with Navigation and App Suite has everything you need to play or stream music. Access your phone, apps, traffic and weather through a 6.1-in. high-resolution touch-screen or voice-command controls. It’s one of many ways Venza adds more fun to your journey. 2014 model shown. Boasting a 7-in. high-resolution touch-screen display, this available App Suite features hard-drive navigation with SiriusXM All Access Radio with 3-month complimentary trial, Bluetooth®, wireless technology, advanced voice recognition, AM/FM CD player with MP3/WMA playback capability, and more. Plus, the new system includes an auxiliary audio jack, a USB port and iPod®, connectivity and control. 2014 model shown. A premium ride deserves premium sound, and Venza delivers with its JBL® audio system. Thirteen speakers—including a subwoofer—work in concert to ensure every note of your music comes through with crystal clarity. 2014 model shown. Venza helps protect you and your occupants with a total of seven airbags, including a driver and front passenger Advanced Airbag System, driver and front passenger seat-mounted side airbags, a driver knee airbag, and side curtain airbags for both passenger rows. Front and rear energy-absorbing crumple zones and a collapsible steering column are designed to help dissipate impact forces in a collision, and help protect occupants. Venza’s heated power outside mirrors now incorporate convex blind spot mirrors, which make it easier to view vehicles in adjacent lanes. Proper tire pressure is important not only for good handling and fuel economy, but also for your safety. Venza's Tire Pressure Monitor System (TPMS)27 evaluates the pressure of the tires and issues a warning if the pressure becomes critically low. Venza comes standard with active headrests28 on the front seats that adjust to help better support the front occupants’ heads during certain lower-speed, rear-end collisions. Venza comes standard with the Star Safety System™, a suite of six active safety features that includes Enhanced Vehicle Stability Control (VSC), Traction Control (TRAC), Anti-lock Brake System (ABS), Electronic Brake-force Distribution (EBD), Brake Assist (BA) and Smart Stop Technology® (SST).